The Arm & Hammer Spinbrush provides a more consistent power delivery and offers a clean that will exceed that experienced by most people using a manual brush. 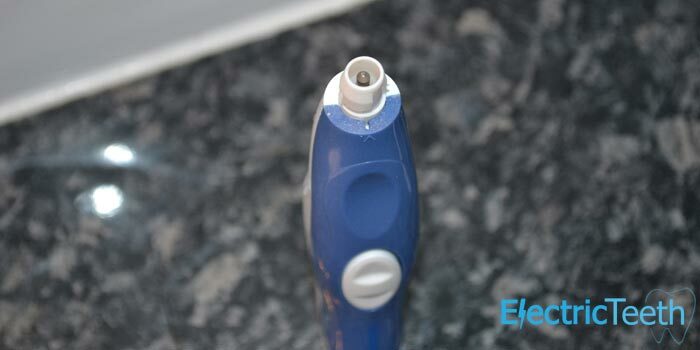 However, the brush has too many weaknesses to make this a viable alternative to the more expensive, but better engineered electric brushes from brands such as Braun and Philips if you intend to use it on a daily basis. If you prefer more detail, you can read our full Spinbrush review below or watch our video review. Although some Spinbrush models were recalled in 2011, the Pro Whitening Model that we are reviewing here was not among them and safety issues will now have been resolved — the recall status was terminated in 2015. 2. Are there any other brushes I should consider? 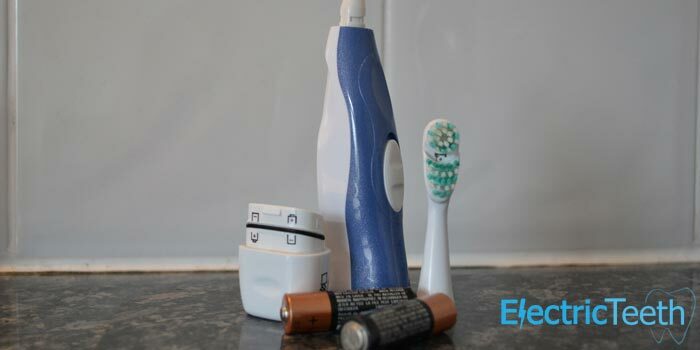 Unless you have a specific need for a battery-operated brush, we do recommend considering a rechargeable electric toothbrush. They offer a better clean and even entry-level models have more features. You may be tempted by a battery brush to save money, but electric toothbrushes are cheap enough now that the cost saving is minimal. 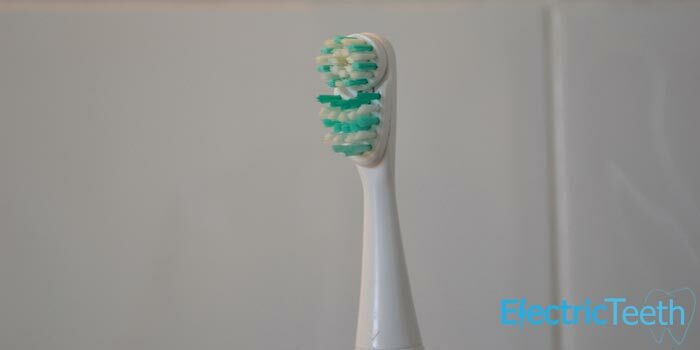 You can check out our recommendation for best budget electric toothbrush here. If it is a removable battery you want, as per our post on the best battery toothbrushes, the Fairywill 959 is our choice. The TempIR SonicWave is also an option, but the Fairywill is slimmer in hand, lighter and offers a better overall experience than the Spinbrush. At the time of writing, the only online retailer we found stocking the Spinbrush was Amazon. It’s always worth checking out eBay for deals as well. Many electrical products, electric toothbrushes included, have proprietary charging connectors. A Philips electric toothbrush uses a different charging station to a Braun and an Apple iPhone has a different connector to a Samsung Galaxy. 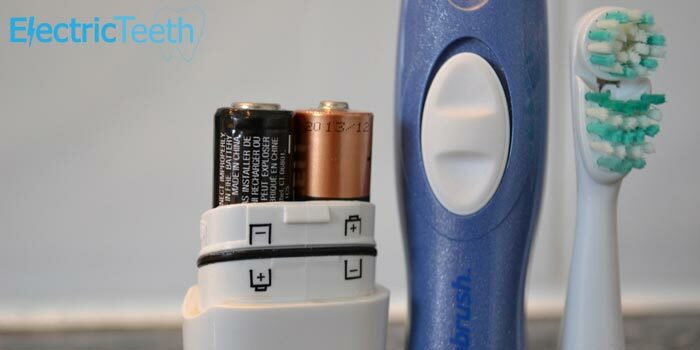 With the Spinbrush Pro Whitening this need not be a concern as there is no special charging connector, just 2 x AA batteries. The Spinbrush comes in a number of different variants. What separates each variant is the brush head supplied. The Spinbrush is a functional looking brush with nothing that really catches your eye. They are available in a range of colours and there are also an array of different Spinbrush models with different heads that are set to achieve different things. 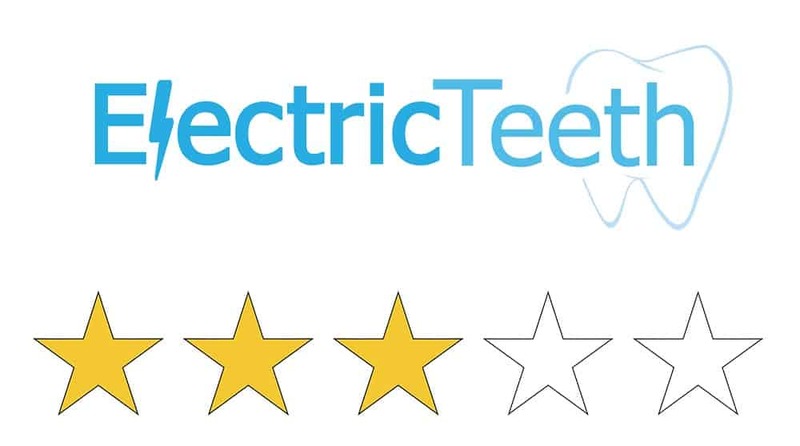 Tested in this review is the Pro Whitening model. In hand the brush feels solid and the single up down button to power the brush on and off is simple and functional, with a grooved design making it relatively simple to grip onto. The power button feels robust and gives a solid feedback. 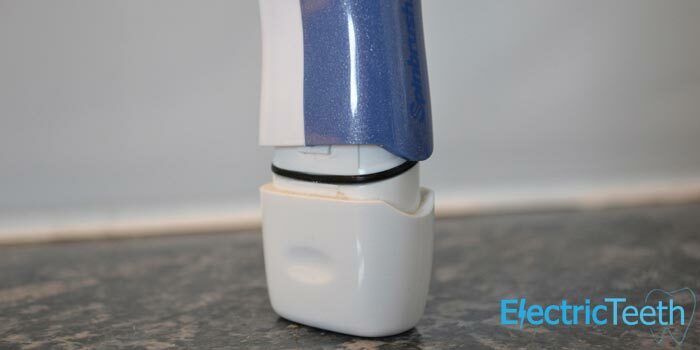 The front of the brush in this instance has a metallic silver blue colour to it, whilst the rear is a glossy white. With the exception of the power button, the body of the brush is made from a smooth plastic which is a little slippy, particularly so when in use. Whilst we all try to restrain from getting the brush wet, inevitably a toothbrush will get wet be it with saliva, water or residual toothpaste. When this happens with the Spinbrush, it becomes more difficult to hold and could really do with some rubber or more grippy material at strategic points around the brush to aid with grip. In particular cases, even reaching for the power switch can be tricky as depending on the size of your hands, the length of travel from the natural resting place could be greater with more chance of it slipping in hand. The base of the brush is removable, and it is within this that the 2 x AA batteries sit. A small rubber seal then stops moisture ingress into the compartment. The sides of the removable section offer contoured grips to assist in removing the compartment, but it is not particularly easy even with two hands, when the brush is dry. You need a good grip and a bit of force. Applying such force does not appear to damage the brush, but it is not the simplest process and weaker or more frail members of society, particularly the elderly may struggle with this. Replacing the part is much easier. It may just have be that my particular brush that is more difficult to open. The good news here is it leaves me feeling the brush is of a good quality, all be it, moisture and grime still builds up very quickly and easily in the small gap that inevitably exists between the two compartments. It is worth noting that whilst running of simple AA batteries, there is no battery status icon, so you have no idea as to how long the batteries have left until you begin feeling the brush power to become weaker. The brush head itself is quite large in comparison to heads I have seen and used on Braun and Philips brushes: it is more reminiscent of a manual brush head. It is dual action head does in part have some bearing on this. The bristles on the brush are of a medium rating, but feel a little stiff and hard for me. Whilst it has caused no long term irritation it has taken a little getting used to and feels at times a little harsher on the gums than I am used to. The head requires a turn of 90 degrees to unlock it from its fastening. This actually feels more secure than some of the more premium brands where they just pull off with a little force. It does make it ever so slightly more fiddly to fit a new head. The brush is a fraction noisier than I had expected but I am being a little critical here. No mention of how many times this action happens per minute is given and regretfully it is not possible for me to count! My teeth feel clean after each use, although in the mouth, I do not find the brush to give the same sensation as I am used to from my daily Oral-B brush. It almost feels underpowered, but I do like how it gives the feeling of a better clean than a manual brush. Arm & Hammer make no mention of the effectiveness of cleaning plaque, which is one of the biggest issues in teeth cleaning. I am sure there are improvements over manual brushing, but no scientific tests have been run in this review to compare to a manual or other electric brushes. In just 7 days I was supposed to have whiter teeth from using the Spinbrush. I am afraid to say after this time and longer I noticed no obvious visible differences. Just how the brush is supposed to do this I am not entirely sure. I would imagine it is from just offering a better clean than a manual brush and the varying angles and heights of bristles on the brush head would lead me to believe this is the case; but Arm & Hammers website, the retailers nor the product packaging give any indications on how this is achieved. One thing I have gotten used to on other brushes is a timer be it visual or audible to indicate to me a 2 minute cycle that is recommended by dentists. Many notify you every 30 seconds up until the end of the cleaning cycle to get you to change quadrants. The Spinbrush does not do this. Battery life on any product is always a guide as there are so many variables, but from my testing I managed to achieve an incredible 540 minutes of usage time. I should point out that whilst I used this brush for a month, the remaining battery life was calculated by leaving it to run and timing it, whilst subjecting the brush head to extra pressure at stages throughout. Different brands of batteries will perform differently. Arm & Hammer provide no official guidelines on expected battery life or recommendations on how to achieve the best battery life. Opting for premium batteries I believe is worthwhile. Using rechargeable batteries could be an option, but this is another expense, but one that could prove more cost effective long term. The price of this brush varies, but as a general rule it will cost somewhere between £5 and £10 and will include at least 1 brush head and a set of AA batteries. I purchased mine for just £5, which is excellent value. As with any brush, replacements heads are required and in this case spare batteries are too. The availability of the heads and the price will vary considerably depending on your location and what deals are about. At the time of writing, to get 2 replacement heads, the cost is anywhere between £10 and £15. For this price I could purchase 2 or 3 replacement brushes. The cost of the brush heads is slightly higher than the cost of those from Braun, although considerably more difficult to source. General availability and prices do appear to be better within the United States of America, where these brushes appear to be more popular and more readily available. On top of this cost you do have that of the replacement batteries. Whilst our usage would suggest a battery life of 4 months, let’s err on the side of caution for the moment and say a set of batteries last 3 months, then you would need to replace them 4 times in the course of a year, resulting in a cost of up to £6 per year. Over 3 years the cost would be approximately £96 or 10p per day. A Braun equivalent would work out at £66 or 6p per day (not including the electric to charge the brush). All told I believe even with the cost of charging the brush any electric brush with a fixed internal battery will provide better value for money, standard of clean and satisfaction than the Spinbrush. There is no doubt that the Spinbrush provides a more consistent power delivery and offers a clean that will exceed that experienced by most people using a manual brush. This brush would be great if you were going trekking, camping or simply even wanted a brush for that business trip or weekend away. The battery life far exceeded what I expected. But, the Fairywill 959 and the TempIR Sonic Wave that feature in our list of battery powered electric toothbrushes, are better buys. Personally, for me this brush has too many weaknesses to make this a viable alternative to the more expensive, but better engineered electric brushes from brands such as Braun and Philips if you intend to use it on a daily basis. Whilst the initial purchase price will be somewhere in the region of £20 more for an entry level brush from these brands, the long term reliability, science and engineering behind them and the peace of mind offered by these will shine through. Hi Jon, thanks for this detailed review. I’ve had one of these toothbrushes for a long time. I bought it as ‘spare’ for when I needed to charge my Oral B. When it got to the stage where I was charging it every two or three days, I started using the Arm & Hammer brush all the time, and I’ve been using it for months now and the battery is yet to run out, which astonishes me. However, like you, I can’t get the bottom off to replace the batteries as the brush is now very slow, so I’m debating buying another one or getting a new rechargeable. Based on all the stuff I have read, I would suggest upgrading, because the like’s of the Oral-B brushes with a battery built in will generally provide a better overall clean. The Oral-B Pro 2 2500 is my recommendation. The decision is of course yours, you may simply feel the value of the spinbrush is so great you would rather not part with it. I am sure you can find someone who can help you get the bottom of it off if you need to, admittedly it is not easy.